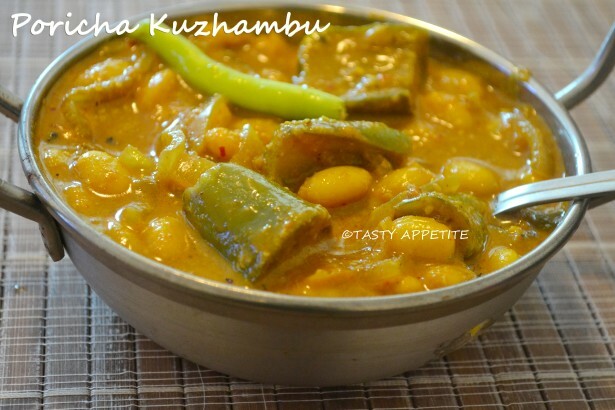 Here comes the unique and traditional Tamilnadu style of Poricha Kuzhambu recipe. 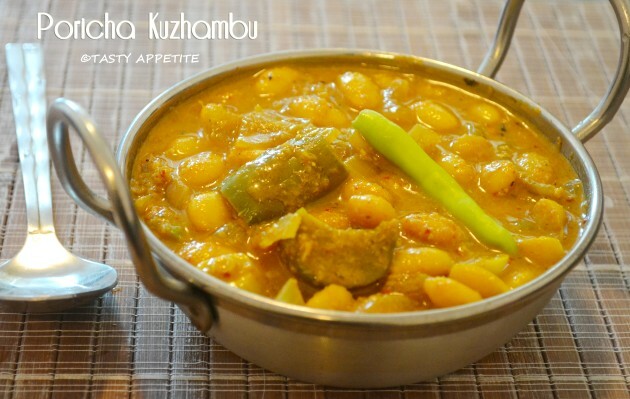 It’s a tamarind based curry with lots of flavor and aroma. This tastes absolutely mouthwatering when taken with hot steamed rice. 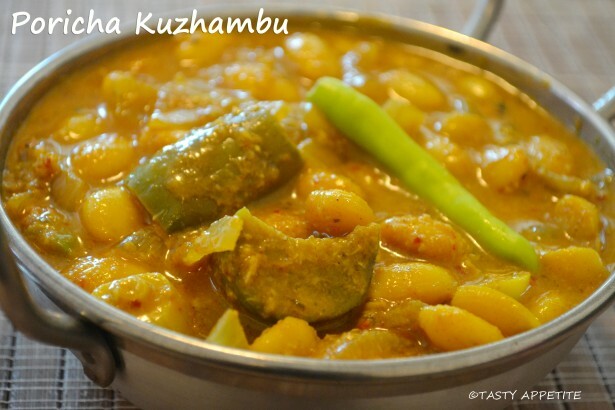 We can prepare poricha kuzhambu with any veggies of your choice like brinjal, drumstick, potato,etc. 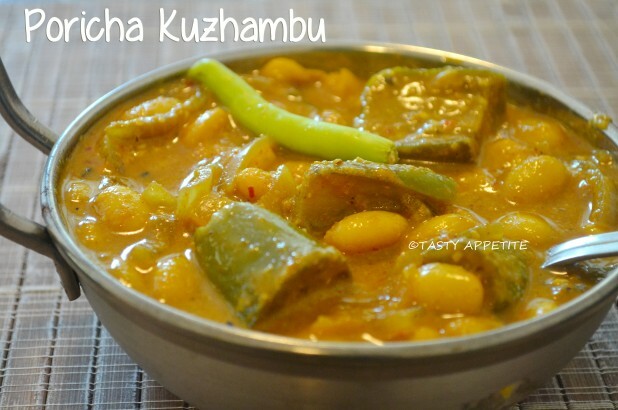 Try this tasty delicious South Indian Kuzhambu variety and enjoy. 1. Wash and soak mochai payar / Lima beans in water overnight. 2. Morning drain the water and add it to pressure cooker. 5. To start with chop onion, tomatoes, garlic, veggies ( like brinjal, drumstick, broadbeans, etc) and coriander leaves. 6. Soak a small ball of tamarind in ½ cup of water. 7. Grate coconut to small pieces. 8. Add it to blender and grind to smooth paste by adding required water. 9. Heat oil in a pan. 10. Add vadagam or mustard, cumin, split urad dal, curry leaves. 12. Add sliced onions and garlic. 13. Saute until onions turn light brown. 14. Add mashed tomatoes and cook for 2 minutes. 15. Add turmeric pwd, red chilly pwd, pepper pwd, coriander pwd and salt. 17. Add sliced brinjals and coat well with the masala. 18. Add 1 cup of water and stir. 19. Cook covered for 4 to 5 mins in medium flame. 20. Once the masala thickens and veggies are done, add the thick tamarind juice. 22. Allow to boil for 2 mins. 23. Add the cooked mochai payar and stir. 24. Taste and adjust salt and seasonings. 25. Add fenugreek pwd, red chilly flakes (optional) and coconut paste. 27. Keep the flame in low and let it cook for few more mins. 28. Sprinkle freshly chopped coriander leaves and turn off the flame. 29. Transfer to serving bowl. 30. Aromatic delicious Poricha Kuzhambu is ready.